I’ve written about the things I screwed up in my relationship with my First and touched on how I didn’t feel loved. One of the things that I learnt from that relationship is that submissive behaviours can obscure traits that I would have seen a mile off in a vanilla man, but didn’t yet have the experience to see in a submissive. If you overlay ‘submission’ on a relationship, it can be harder to pinpoint where a feeling of disquiet is coming from (the same is true of dominants of course) because the agreed D/s behaviours can hide what’s underneath. I thought he was selfish, but I couldn’t quite put my finger on why I thought that when he was really doing everything I asked of him. It was a vague and nebulous discomfort, the feeling that he weighed everything in terms of ‘what’s in it for me’ as if he thought I was always trying to ‘get one over’ on him (in hindsight, this makes more sense given the betrayal-that-wasn’t: I imagine a distrustful hurt boy trying to protect himself from falling apart). By the time we got together, I’d fallen in love twice in my life, and I had been the target of love more times than that. I knew what it felt like to be loved and I struggled with the fact that what we had, what he claimed, didn’t feel like love to me. But nailing down ‘why’ was near impossible. And one day, something happened that exemplified and clarified it for me. 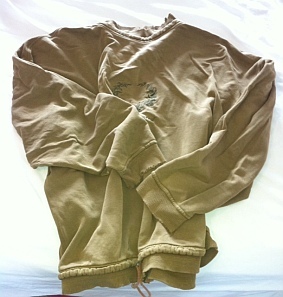 I wrote about it here when I described still having my First’s sweatshirt. But I wrote it as a little piece of nostalgia without explaining its significance. It seems a small thing, but that was the moment that illustrated and brought home to me why I didn’t feel loved. My experience of vanilla men was that they would literally give me the shirt off their back if I asked for it. I knew that if I was to go into their wardrobe and pick out their absolute favourite shirt, they would gladly offer it up to me if they thought it would make me happy. Because they loved me. And they would go above and beyond to show that in a million different ways. And here I was with a man who claimed to love me, a *submissive* man whose goal was to please me, and he couldn’t even bear to give me a shirt that essentially came out of his garbage. OUT OF HIS GARBAGE! It was a defining moment for me. Perhaps even a relief that I could see tangible evidence of what I had felt in nebulous, indefinable ways, but couldn’t put my finger on. And to be clear: it’s not that he didn’t love me in his own way, it’s that to me that’s not what love looks like, and having something concrete to hang that feeling on was a blessed relief. I love that sweatshirt, more perhaps *because* of the way it came into my hands. I bring it out every winter: slipping into something old and worn that holds my history has a lovely comfortable familiarity to it. It’s been a long time: I’ve grown, I’ve learnt things, I’ve changed. He has too. But the hints of familiarity are there with him also. We are working on getting to know the new people we’ve become, and our history is a lovely bond, even if we shake our heads at past-us, even if we didn’t navigate all that as well as we might have. I don’t recall this happening at all, but I can only shake my head at this. It’s a sad insight into how immature, insecure and petty I was at the time. For me, the positive out of reading this, is realising just how much the person who was me then, is definitely not the person I am today. I recognise the person you describe, but I’ve put a lot of distance between him and me. I wouldn’t expect you to remember it: though it’s really interesting to me which moments hold something important to someone and which go by completely unnoticed by the other party. A million of them slipping past without us seeing some bolt of revelation in the other person’s eyes. *smile* You have. We both have. And I know we both want to take past-us and give them both a good talking to, maybe a cuff around the ear. I appreciate your indulgence in letting me share some of these personal moments here, thank you *warm hug*. See, I would have interpreted that completely opposite. To me, that would have read: This old shirt that I didn’t want, I now desire because it looks so cute on you that I want to hold on to that memory every time one of us wears it. Apparently I would have been wrong in that interpretation. But it just goes to show! *laugh* Well, perhaps in a different context (like one of happiness and love and light) there might have been different ways of interpreting it. But in this context: nope. There is something so intimate about wearing your lovers clothes, especially when they are still warm and smell of them. Though it’s also really sweet when you pick it out of your wardrobe and slip it on after time has passed. *laugh* A romcom? Fine, I’m in.